The Generalized Sequential Querier is a computer program for analyzing sequential observational data. It computes a variety of simple and contingency table statistics. Simple statistics include frequencies, rates, durations, and proportions (percentages). Table statistics include joint frequencies, adjusted residuals, chi-squares and, for 2×2 tables, Yule’s Q and odds ratios. Statistics can be computed for various lags, and separately for each session or pooled over sessions, levels of a factor, or both. The Sequential Data Interchange Standard is a language for describing sequential data as obtained thru direct observation of individuals, interacting dyads, or groups. GSEQ includes a compiler for SDIS-formatted data files that converts them into MDS files (modified SDS files), which are then analyzed with the various analytic procedures included in GSEQ. Data can be entered manually into SDIS files, or converted from other data formats such as those used in Mangold’s INTERACT and Noldus’ The Observer videoanalysis software using our standalone utilities ActSds, OdfSds (The Observer Version 5 and earlier), and ObsTxtSds (The Observer Version 6 and later). Data modification: GSEQ’s data modification capabilities expand analytic possibilities. New codes can be created form existing ones using standard logical operations (e.g., and, or, not) or by recoding, lumping, and chaining. The window command is especially useful. It lets you define new codes (windows) that are tied to onsets and/or offsets of existing codes and, in particular, peform time-window sequential analyses. Exportation: A major use of GSEQ is to produce statistics for export that are then analyzed by standard statistical packages such as SPSS or R or by standard spreadsheet programs such as Excel. More generally, GSEQ’s output consists of simple tab-delimited text files that can be read into and manipulated by any spreadsheet program. Data plotting and interobserver agreement: GSEQ also includes helpful data plotting routines and procedures for assessing interobserver agreement with event-based and time-based kappas. Bakeman, R., & Quera, V. (1992). SDIS: A sequential data interchange standard. 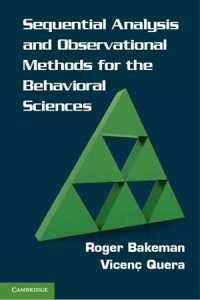 Behavior Research Methods, Instruments, and Computers, 24, 554–559.